Up to 70% of operational costs in your business are spent on salaries and wages. Are you making sure that time is accurately and fairly measured, reported and analysed to ensure optimum efficiency? You’re responsible for one of the most important aspects of any individual’s working life – their remuneration and getting it wrong can have dire consequences. SmartTime offers a unique, single platform for Time and Attendance to measure shift employees, and employee timesheets to record project timesheets for salaried employees. With the SmartHR leave engine, scheduled and unscheduled leave can be managed for all employees, regardless of how it is accrued, and compared against time recorded for a complete picture of time spent. Time is recorded differently by different employee groups. 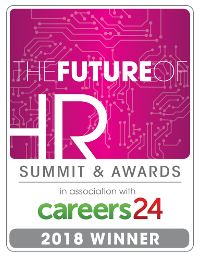 Shift-based employees record time using biometric readers that convert time to normal time and overtime hours based on shift rules. Salaried employees record hours against projects for client invoicing and project expense tracking. All employees take scheduled and unscheduled leave. With SmarTime, you can create any work cycle and shift pattern, set grace periods, rounding rules and fixed or flexi breaks. 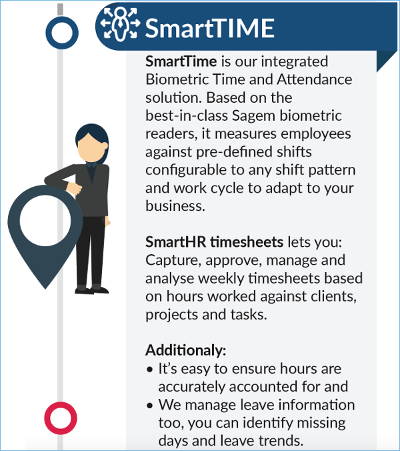 Using trusted SAGEM biometric devices to automatically record clockings, the SmartTime engine accurately calculates normal time and overtime which can be sent directly to your payroll. SmartHR timesheets record hours for projects against clients, projects and tasks to accurately track billable and non-billable hours. Hours are captured online by employees and managers for the week. Our task-based, approval engine lets managers and the finance department approve timesheets with communication via email and SMS. You can record expense claims and track the distances from your office to clients to ensure accurate claims. Since SmartTime is part of the SmartHR suite, it provides rich analytics on the productivity in your organisation to ensure less waste and higher efficiency. Call us today to see how we can save you time.